Completed in 1963, Dillon Reservoir has an earth-fill dam, 5,888 feet long by 231 feet above the Blue River streambed. The entire town of Dillon and a hydroelectric plant were relocated to build the dam, which diverts water from the Blue River Basin through the Harold D. Roberts Tunnel under the Continental Divide into the South Platte River Basin. Boating: The ramp at Dillon Marina is unusable for most motorized craft at water elevation 8,971 feet; for Frisco Bay Marina, 9,009 feet. Fishing boats, sailboats, kayaks and canoes can be rented at area shops. Sailboat tours originate from Dillon Marina. Canoe tours, rental canoes and fishing boats launch at Frisco Bay Marina, which also houses the Frisco Rowing Center. Fishing: Below the dam, the state designated the Blue River as Gold Medal waters. 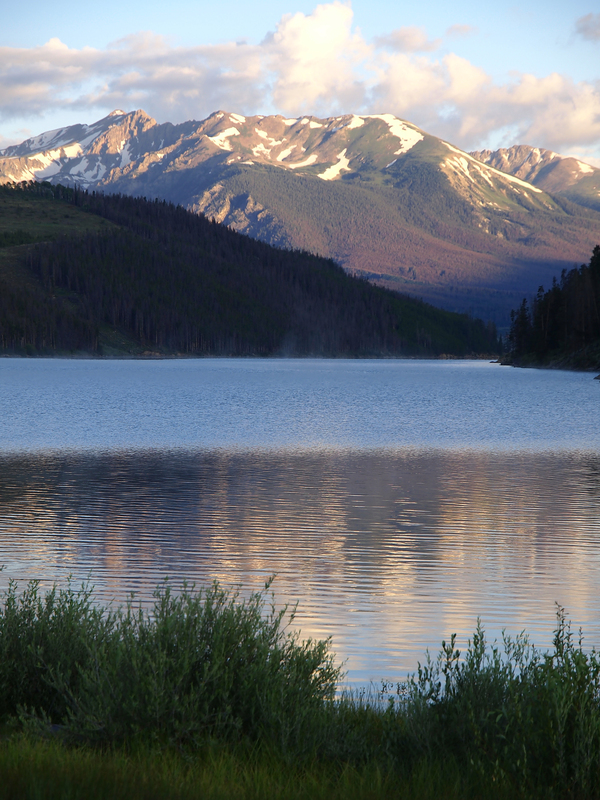 Check Colorado Parks and Wildlife for special regulations above the reservoir. Ice fishing when conditions permit. Camping: Nearly 350 designated sites for tents, pickup campers, RVs and trailers. All campgrounds have a drinking water supply. Most are provided by U.S. Forest Service; reserve at 1-877-444-6777. 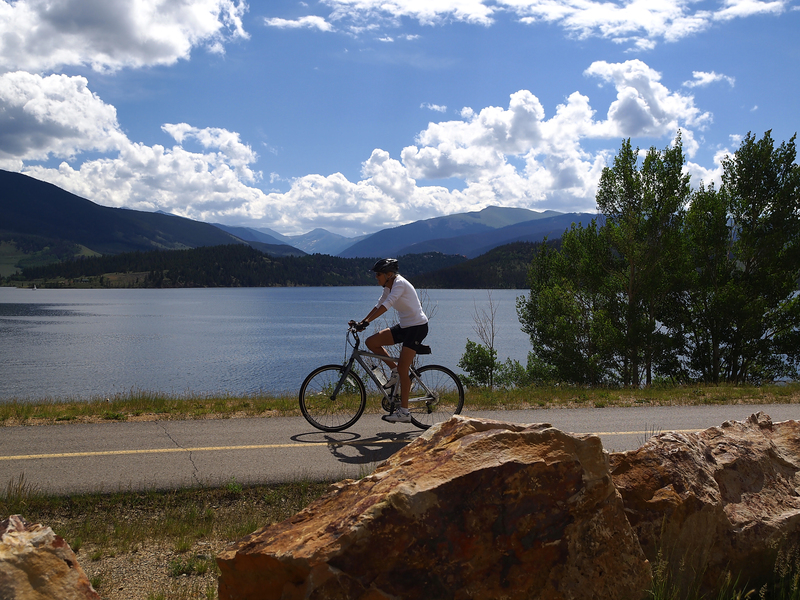 Hiking and biking: Enjoy more than seven paved miles of the Summit County system. The Sapphire Point trail follows a half-mile path to the overlook. The Old Dillon Reservoir trail connects to the lake which supplied drinking water for the old town. Scenic overlooks: See the dramatic backdrop of the Gore, Williams Fork and Ten Mile mountain ranges. Waterfowl hunting: Allowed in the Dillon Reservoir Recreation Area boundaries strictly in accordance with all applicable regulations. Cross-country skiing: The Frisco Nordic Ski area provides a cross-country ski trail system and ski rentals. Special events: Marinas host regattas and other events, fireworks highlight the Fourth of July and Frisco hosts winter Gold Rush activities. 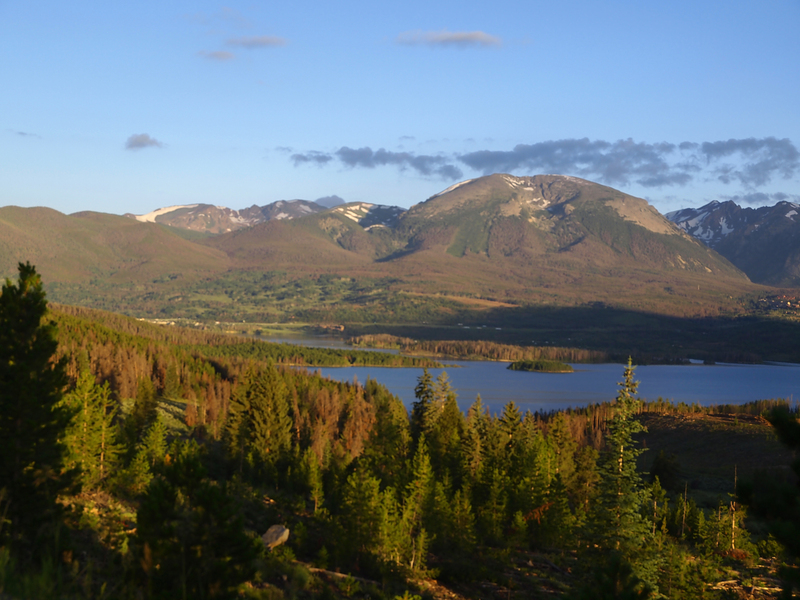 The Dillon Reservoir Recreation Committee requires permits for all special events and commercial activities; call Summit County at 970-668-4213. From Denver, take Interstate 70 through the Eisenhower Tunnel to Dillon. To access Dillon Marina: Take Silverthorne exit 205 to Highway 6. Take Highway 6 to Dillon. Follow the signs to the marina. To access Frisco Bay Marina: Take Frisco exit 203 to Highway 9. Take Highway 9 to Main Street and turn left (east) to the marina. Due to the cold temperatures and water quality concerns, water contact sports, including swimming, scuba diving, water skiing and other water contact related activities, are prohibited. Windsurfing (sailboarding) with a full body wet or dry suit is permissible. It is unlawful to use, light or ignite fireworks or explosives of any type, except by permit from the management committee. Dispose of all litter, wastewater and fish entrails in proper trash containers. Motorized vehicles, including automobiles and motorcycles must be licensed and remain on designated roadways. Recreational vehicles, vehicles with trailers and any vehicles transporting hazardous materials are prohibited from driving on Dillon Dam Road. Self-propelled wheelchairs used for the transportation of mobility impaired individuals are allowed on ramps, paths and roadways. All pets must be kept on a leash and under control at all times; pet owners must clean up after pets. Trespassing on any dam structure, spillway, facility building or other closed area is prohibited. Waterfowl hunting is allowed in the Dillon Reservoir Recreation Area (DRRA) boundaries strictly in accordance with all applicable federal, state, and local regulations. Firearms or weapons are not permitted within the DRRA boundaries. Shotguns used exclusively for waterfowl hunting are exempt from this prohibition only during hunting season. Hovercraft, seaplanes, amphibious craft and personal watercraft are prohibited. Vessels equipped with an above-transom exhaust are not allowed. Wakeboarding, waterskiing, paraskiing, paragliding, parasailing and other forms of recreational towing are prohibited. Motorized vehicles, including snowmobiles, on Dillon Reservoir's ice surface are prohibited. Non-motorized users may proceed on the ice surface at their own risk. 30 mph speed limit: It is unlawful for any boat or vessel to travel at speeds in excess of 30 mph at any time under any circumstance, excluding law enforcement and emergency response operations. 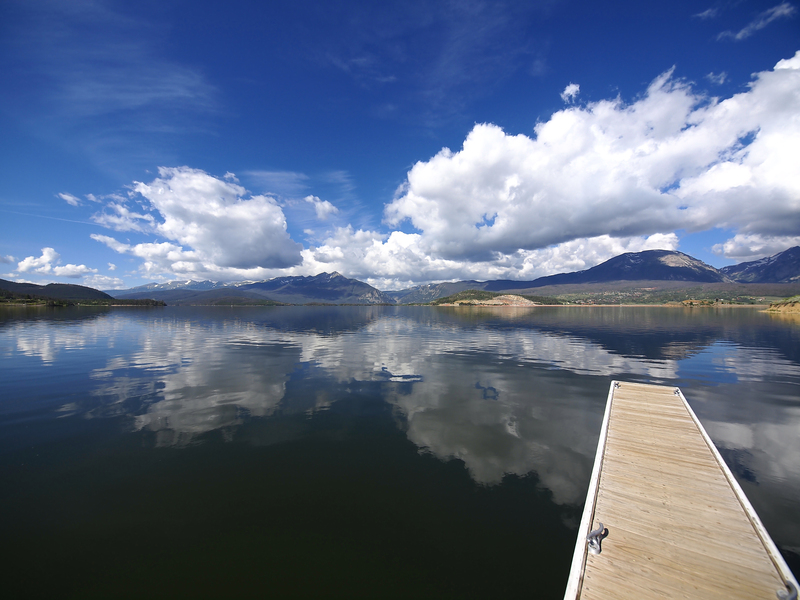 Personal watercraft, including jet skis, are not permitted on Dillon Reservoir. Boat operators are required by state law to carry safety equipment specified for the size and type of boat, which includes person flotation devices (PFDs), navigation lights, backfire flame control, fire extinguishers, audible devices such as whistles, and muffler and ventilation systems. PFDs and fire extinguishers must be readily accessible; fire extinguishers should be kept in a location away from the engine and fuel tanks. PFDs must be worn at all times by children 13 years and under. 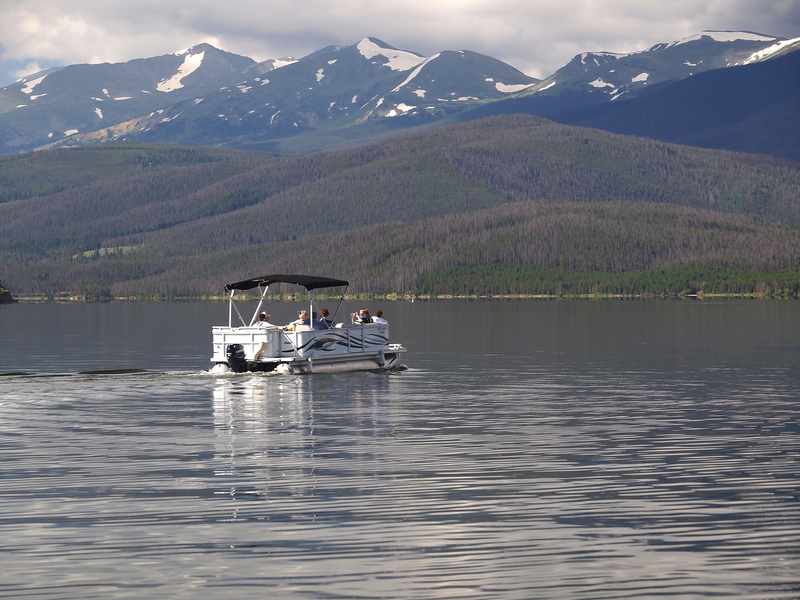 All vessels on the water’s surface must be properly registered through the Colorado Division of Parks and Outdoor Recreation Registration Unit and must display the registration number in the proper location on the vessel. All boats except inflatables, canvas boats, canoes and other portable craft must be launched from one of the boat ramps. Vehicles are not allowed to park on the boat ramps, except during loading and unloading. Always operate your boat defensively, watch out for the other boats and use courtesy on the water. If you are in doubt as to a safe operating speed, or who has the right-of-way, slow down or yield to the other boater. While boating, you may encounter unmarked shallow areas and submerged obstacles. Be observant and use caution while boating. Boaters can store their trailers for the day at the lot on Lodgepole Street in Dillon and in the designated areas at the Frisco Bay Marina and Pine Cove Campground. Trailered boats can only enter the water at the Dillon Marina and Frisco Bay Marina. All hand launched boat ramps have been closed. All trailered boats will be subject to mandatory aquatic nuisance species inspections provided by the Towns of Frisco and Dillon at the marinas in cooperation with Denver Water. All campfires of any nature on any lands including all shoreline areas of the reservoir are prohibited except where fireplace grills and fire rings have been provided. Never leave a campfire unattended, and always comply with the U.S. Forest Service and local fire bans. Campgrounds are operated by concessionaires and require U.S. Forest Service permits. Camping on islands is prohibited. All types of camping are restricted to a total period of no more than 14 days. Following the 14-day period, person(s) may not relocate within the Dillon area for a period of seven days. Leaving a camper, trailer, pitched tent or motor vehicle unattended for more than 24 hours is prohibited. Management asks that all campers be quiet between the hours of 10 p.m. to 6 a.m.
Any person 16 years of age or older is required to have a valid fishing license. Colorado Parks and Wildlife enforces all fishing regulations.